HopStop, the transit-navigation app that Apple recently acquired for an undisclosed sum, appears to have had its platform availability narrowed a bit since the deal closed. 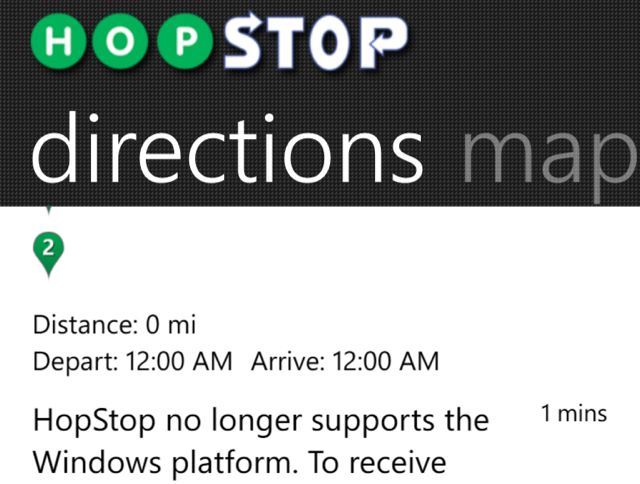 Though it was available for Windows Phone as recently as last week, HopStop’s support for Microsoft’s mobile operating system has been discontinued without explanation. The app has disappeared from the company’s Windows Phone Marketplace, it has been erased from the HopStop Apps page, and its Windows Phone iteration now pops up a “HopStop no longer supports the Windows platform” alert when launched. And all this appears to have happened following the close of HopStop’s acquisition by Apple. News of the app’s fate was first reported by WindowsObserver.com. 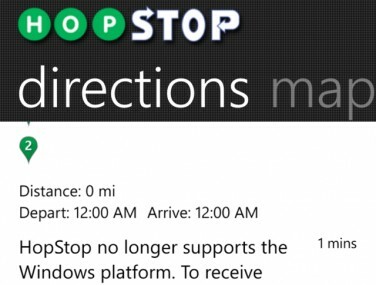 Why was support for HopStop on Windows Phone discontinued, and who made the call? That’s not clear. Reached for comment, Apple would say nothing beyond the statement it gave to AllThingsD last Friday, confirming the buy. And HopStop CEO Joe Meyer didn’t respond to queries. Given the timing, however, the app’s scrapping seems pretty likely to be related to the Apple deal. But the rationale for that move? Again, unclear. HopStop remains available for Android via Google’s Play Store. So support for some non-Apple platforms continues, post-acquisition. Was the Windows Phone market share too small to merit continued engineering investment in a HopStop app for the platform, now that Apple owns it? Or was it simply the first rival platform to go, as Apple gears up to ingest the company? And is Android next in line?